Supports Apple Watch Series 4 with the new beautiful Infograph and Infograph Modular watch face complications! 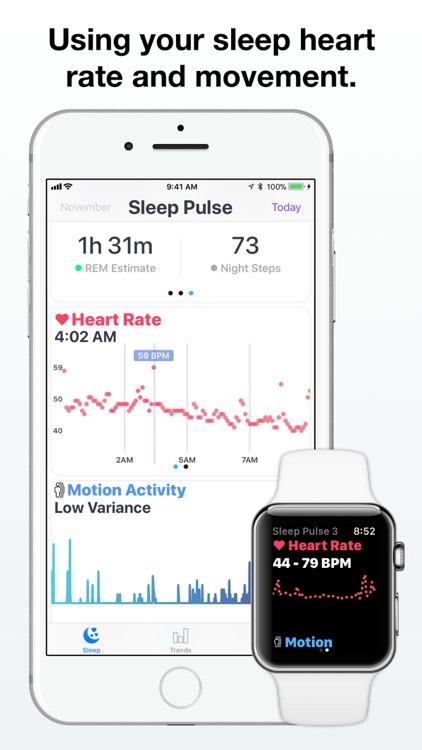 Noticing that other "sleep trackers" on the App Store claim to accurately track sleep with Apple Watch automatically — using only your heart rate — is misleading, and a better updated app needed to be an option for Apple Watch. Because our sleep is more complicated than just our heart rate, our movement is also part of the picture. These "auto track" apps don't use motion, as it is something that needs to be processed directly, not in the background on watchOS**. Hello, Sleep Pulse 3 Motion. 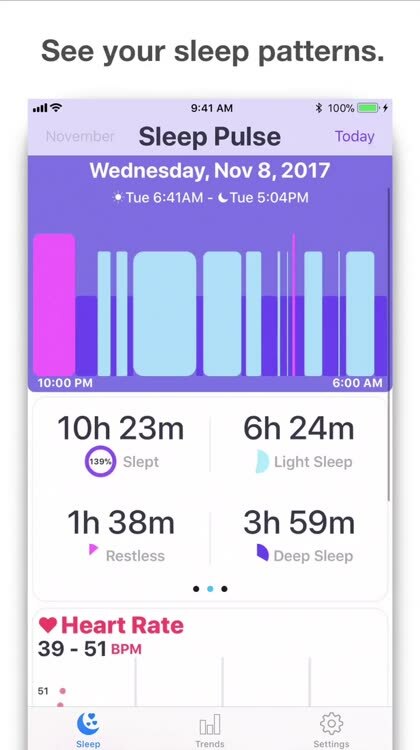 Sleep Pulse 3 is the only native Apple Watch app that can additionally support* Nap Tracking with "Power Nap", and Sleep Talk recordings with "Sleep Talk". All trackable from within Sleep Pulse 3! 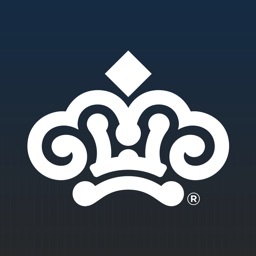 • Bold Design, the app opens to your last sleep report with your sleep goal, sleep analysis, heart rate, and motion. The new Sleep Goal Ring and Analysis Donut Ring can be tapped for additional information. 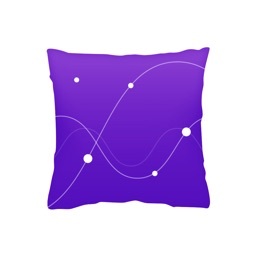 • Sleep View, designed to provide context while you sleep including when you went to bed, how long you have been in bed for, and your live heart rate. • Resting Heart Rate, upon wake your resting heart rate will be measured — a good measurement of your overall health. 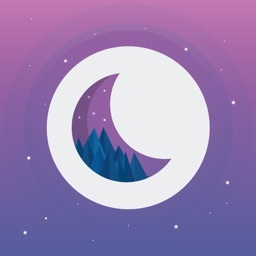 • Sensitivity Level, because we all sleep differently and in different places (cars, boats, planes, camping etc) the sensitivity level for analyzing your sleep may be adjusted from the watch app. 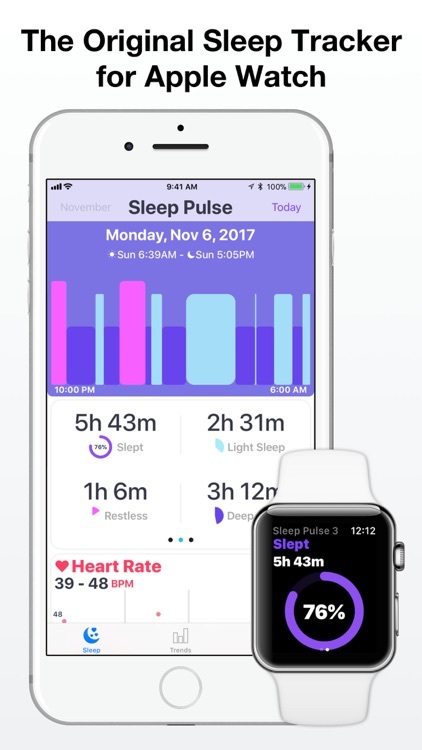 • Complication Support, for best use add Sleep Pulse 3 to your watch face with a complication and see how much of your sleep goal you complete each night. • iPhone Independent, away from your iPhone for a night? 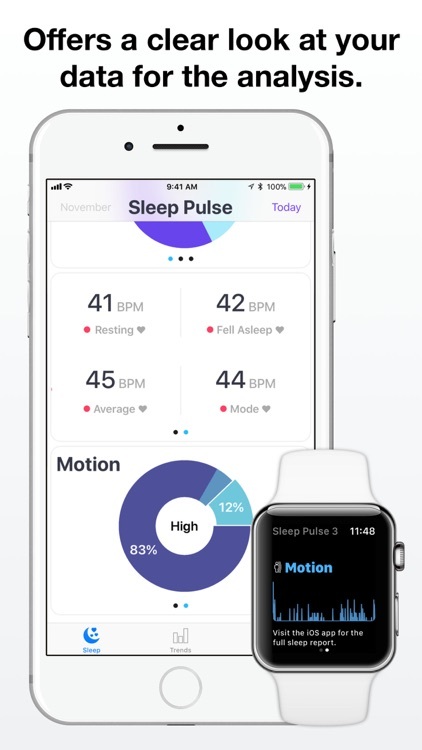 No problem Sleep Pulse 3 analyzes your full sleep without your iPhone, when connected it will sync the data. 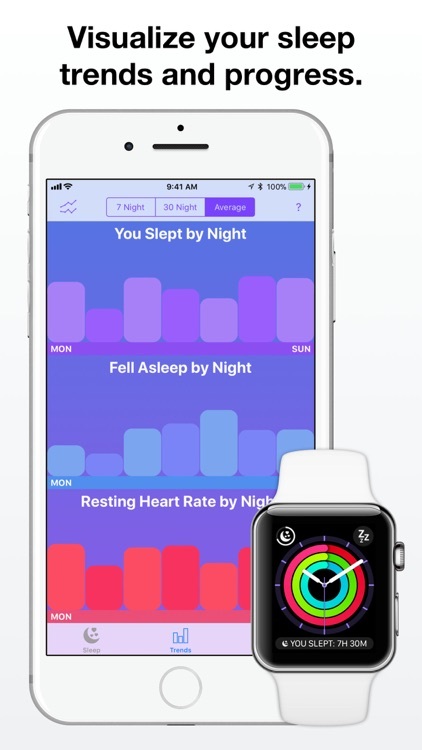 Get your sleep report directly on your Apple Watch. 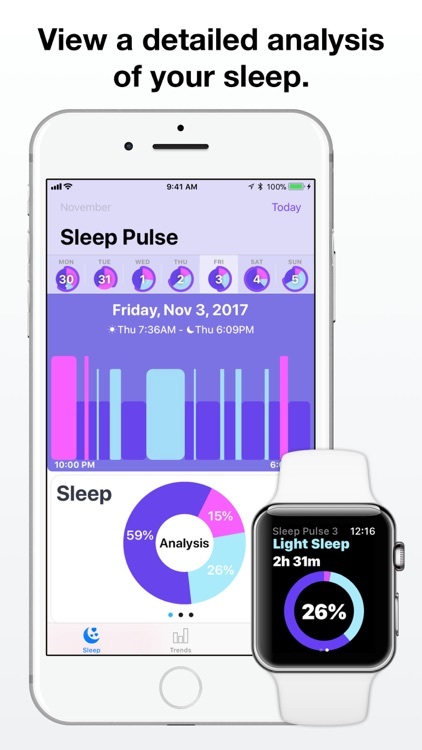 • Bold Look, Designed to provide a cleaner and clearer look at your sleep with vibrant colors, haptics, large text, sleep ring and sleep analysis charts. • Analysis Charts, see a breakdown ratio of how you slept on the sleep analysis donut chart. Also see detail of the type of motion that occurred during your sleep on the motion analysis donut chart. 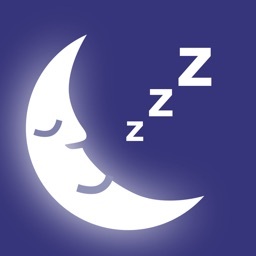 • Sleep Talk Add On, to provide you with potential sleep talk recordings from your night — View the app "Sleep Talk" for more info. 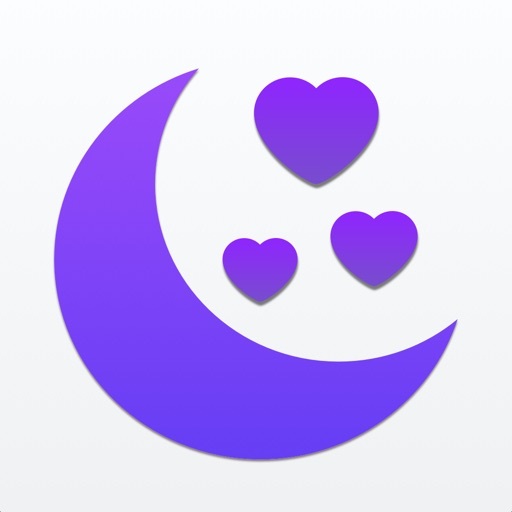 HealthKit is used to save your sleep data to the Health app on your iPhone. watchOS 5 and iOS 12 are required for use, 5.0 and 12.0 are recommended for best use. SLEEP PULSE 3 MOTION IS NOT FOR MEDICAL USE AND SHOULD NOT BE USED TO DIAGNOSE, TREAT, OR MONITOR ANY MEDICAL CONDITION. CONSULT YOUR DOCTOR WITH ANY QUESTIONS.